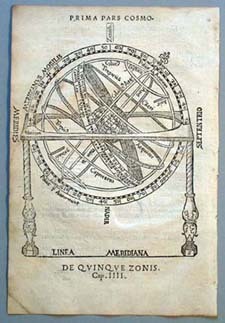 Cosmographia's illustration of the armillary sphere is among the most prominent in the book. 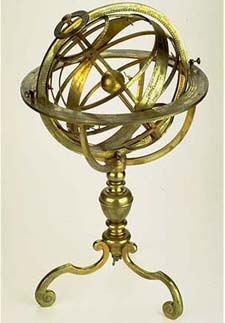 One of the instruments of Ptolemy's Almagest, the armillary sphere was originally intended for observational measurement. Because of its inherent instability it was never successful in this capacity and was used largely for didactic purposes. For example, Tycho Brahe was unable to make accurate measurements with his famously large armillary and abandoned its use. As a teaching instrument it was often miniaturized, mounted with a handle instead of on a cradle. In artworks, the armillary often stands as the symbolic instrument and status symbol of astronomers.